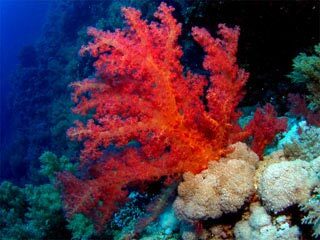 Thanks very much for subscribing to SCUBA News. This month I've enjoyed reading The Darkness Beckons - review below. I hope you find the newsletter useful - you can download a pdf version here. PADI Five star resort - find your freedom underwater. Courses taught in English, Spanish, French & German. 1600 km out into the Atlantic, sea life abounds at the Azores - from nudibranchs to manta rays. Who to dive with in Malaysia? 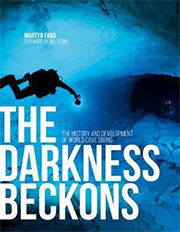 The definitive cave diving book since its first issue in 1980, author Martynn Farr has brought The Darkness Beckons bang up-to-date. He covers the earliest origins of cave diving right up to discoveries made in 2015. There are two types of cave diver, cavers who become divers and divers who become cavers. The earliest cave dives were mostly the former - "iron-willed individuals prepared to risk all". Take Frenchman Norbert Casteret. In 1922 he plunged through sumps - flooded sections of caves - with little more equipment than candles wrapped in a swimming cap. The first use of diving kit in a cave came much earlier though, in 1878. Again in France, M. Nello Ottonelli used deep sea diving kit to descend to a depth of 23 m in a resurgence (where an underground river surfaces). This was the globe helmet of old films to which air was pumped down. Amazingly, the first use of SCUBA (self-contained underwater breathing apparatus) came as early as 1880 in a railway tunnel being built under a river in the UK. This was possibly the earliest rebreather, with not air but compressed oxygen on the diver's back. A man called Alexander Lambert dived 12 m down, walked 300 m in pitch black past obstacles and abandoned equipment, with no communication with the surface. He successfully accomplished his dangerous task of closing a heavy iron door and valves. The first female cave diver was Penelope Powell, part of the 1935 Wookey Hole expedition. Cave diving exploration though took off in the 1940s and 50s, after Jaques Cousteau and Emile Gagnan invented the aqualung. 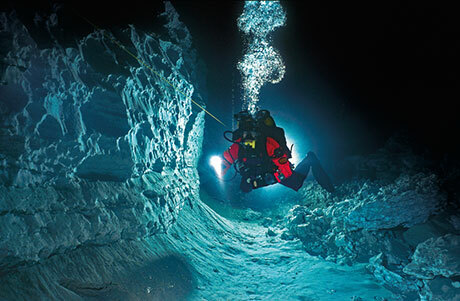 The expeditions and incidents in cave diving informed SCUBA developments and advanced knowledge throughout the sport. I read this book whilst a short walk away from the Green Holes of Doolin, one of the few cave systems in Britain and Ireland entered from the sea. Being a caver I've met some of the people mentioned in the first third of the book which concentrates on the UK and Ireland. All of which helped to make this book a joy to read. Wookey Hole deep route to Chamber 20 by Martyn Farr. When the book progresses to the rest of the world there are many more instances of cave diving from the sea or rivers. In France, for example, at least 10000 river cave dives are made each year just in the Lot area. With warm water (22 o) and good visibility (30 m), Florida has well over 1500 cave-diving sites - a long way from some of the cold, tight caves described in the first third of the book. 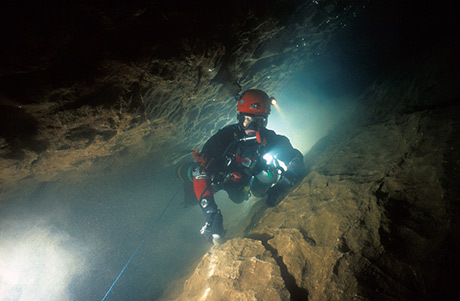 Cave divers in the US have often led the way in equipment, technique an approach. 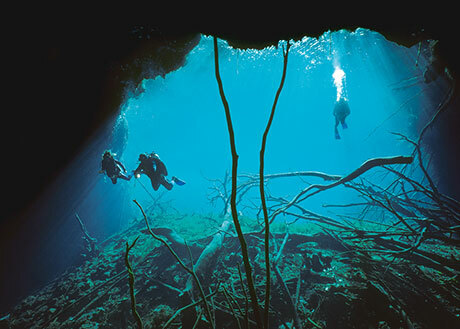 Also incredibly beautiful are the Blue Holes of the Bahamas and the Cenotes of Mexico, shown in some fabulous photos. Mexico Carwash Cenote by Martyn Farr. Comprehensive, the book also includes China, Australia, New Zealand, Zimbabwe, South Africa, Namibia, Canada, South America, Russia, Norway, Germany, Switzerland, Italy, Spain and the Czech Republic. A Ordinskaya wintery environment - the longest underwater gypsum cave in the world which is in the Urals. You should buy this book if you have the slightest interest in diving in caves, technical diving or indeed caving itself. It has over 400 photographs and illustrations, including some awe-inspiring underwater ones plus those of beautifully decorated dry chambers. Martyn Farr is an internationally renowned cave diver and has been part of teams discovering many miles of underground passage. The Darkness Beckons is published by Vertebrate Publishing for £25, widely discounted on-line to £20.29. Study surveyed 711 tourist divers over a one year period and documented their expenditure, including accommodation, transport, living costs and other related activities during divers' trips. New retrieval pod enables the recovery of moorings, which would otherwise be left on the seafloor. Errors in past research studies could undermine conservation plans. Our plastic addiction is out of control. How can we consume less? A new international study has measured the effect of loud sounds on migrating humpback whales as concern grows as oceans become noisier.